it's MEGA FOOD SALE again! SM Megamall is my transit point from Binangonan Rizal to Manila.That said,it has been equated to convenience for me and my wife.Once we are in megamall,everything else becomes easy.Welcome to the civilized world they say.And that is just one of the many reasons why I love the place. 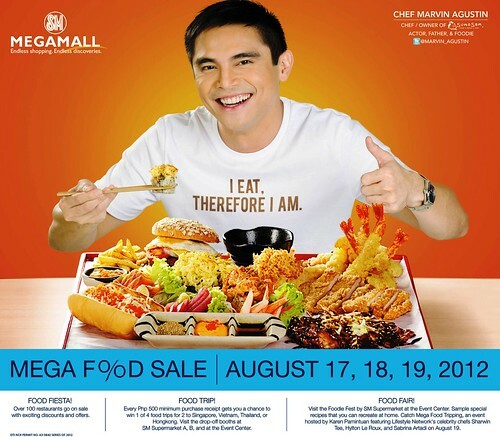 One of them is worth mention as it will take place in a few days,August 17,18,19 to be exact.I am referring to the Ultimate Food Trip, SM Megamall's MEGA FOOD SALE!!!! With over 100 dining establishments on sale, get ready for nonstop dining discounts and promos, huge price offs & delicious offers – Buy 1 Take 1s, Eat all you cans, free appetizers, free desserts, free drinks, and many more! And here’s the icing on the cake: Get a chance to win an all-expense paid food trip to exciting destinations like Hongkong, Singapore, Thailand, and Vietnam! We will also be having a Foodie Fair with SM Supermarket & the Lifestyle Network at the Event Center. This is One Mega Food Trip that can’t be missed. .....for updates and to win delicious free treats,make sure to follow SM Megamall on Facebook and twitter.Links to respective accounts below. OMG! 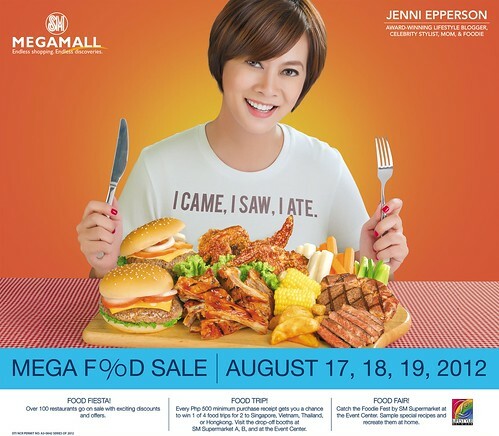 I think this is the second MEGA food sale event for this year. Not yet done with my food blogs from my first ever food sale at Megamall last year. So many dishes to eat..so many things to blog..so little time..whew!